Edgar Degas (1834–1917), The Dance Lesson (c 1879), oil on canvas, 38 x 88 cm, National Gallery of Art, Washington, DC. Wikimedia Commons. Soon after 1870, when Edgar Degas started to paint individual dancers in the ballet of the Paris Opera, he made more complex compositions involving multiple dancers performing different activities. These works often appear to be straightforward paintings of lessons and rehearsals, but in many cases were carefully composed from sketches of their individual elements, and different compositional variants. They may thus be as sophisticated as Degas’ overtly narrative works, for example, and not just concerned with form and movement. Reading them is a challenge. 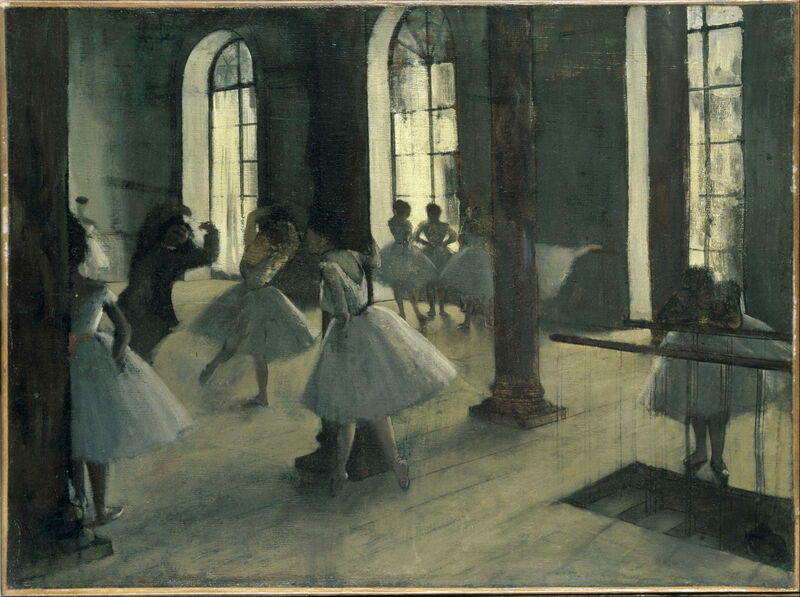 Edgar Degas (1834–1917), Rehearsal in the Foyer of the Ballet (1870-72), oil on canvas, 40.6 x 54.6, The Phillips Collection, Washington, DC. Wikimedia Commons. Rehearsal in the Foyer of the Ballet (1870-72) shows a scene in the foyer, or practice area, of the old Ballet of the Paris Opéra, in Rue Le Peletier, which burned to the ground in 1873. At the left, a dance master is demonstrating to his pupil, as another watches, holding one of the columns. In the distance, a group of three dancers are gathered by a fourth (who is mostly obscured by another pillar), who is practising at the barre. At the right, a dancer leans on what appears to be a set of parallel bars, but which are actually rails around a staircase leading down to a lower level. Edgar Degas (1834–1917), The Dance Foyer of the Opera in the Rue Le Peletier (1872), oil on canvas, 33 × 46 cm, Musée d’Orsay, Paris. Wikimedia Commons. The Dance Foyer of the Opera in the Rue Le Peletier (1872) is another scene set in the practice areas of the original building. The foreground shows a single dancer apparently performing for the benefit of two men. One, holding a large wooden stick used in teaching, is the ballet master, and is coaching the dancer. The other, seated by a music stand, holds the bow of a violin in his right hand, but his instrument is almost concealed behind the ballet master. He has been providing the music to accompany the dance. There are five dancers around the two men. Two stand, watching intently the dancer being coached. A third is sat on a low stool, also watching. Two dancers at the far right are by a notice board. Other dancers are at the barre, and in another area through an arch. There is even one almost obscured as she passes by the door at the left. In the centre foreground is a chair, on which are various ribbons, etc., which may belong to the dancer who is being coached. 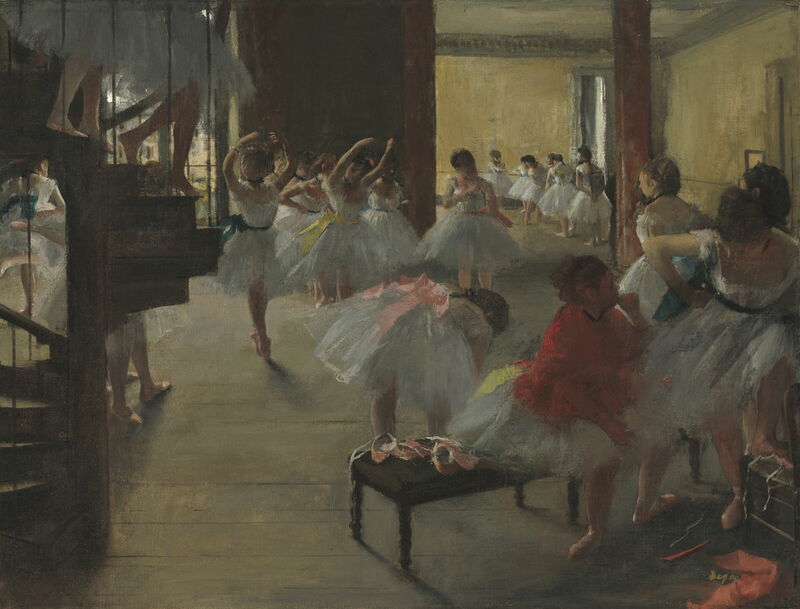 The Dance Class (c 1873) is one of Degas’ busiest and most complex images, with parts of more than twenty dancers visible on its canvas. One theme is the dismemberment of the dancers by their dress, here augmented by various structures and the bodies of other dancers. This is most apparent in the two pairs of legs seen descending the spiral stairs at the top left, but occurs across the entire painting. The dancers are shown in three distinct groups, each of which is engaged in a particular activity. In the foreground, three are completing their preparations by donning their shoes, prior to dancing. Behind them, and to the left, a tight-packed group is practising together, their arms held above their head. In the distance is a chain of dancers practising at the barre. Edgar Degas (1834–1917), The Rehearsal On Stage (c 1874), pastel over brush-and-ink drawing on thin cream-colored wove paper, laid down on bristol board and mounted on canvas, 53.3 x 72.4 cm, Metropolitan Museum of Art, New York, NY. Wikimedia Commons. The Rehearsal On Stage (c 1874) was painted in pastel over a brush-and-ink drawing, using a similar process to Degas’ monotypes with added pastel. The scene is a rehearsal for a performance, with various dancers seen on stage, and the dance master at the left coaching two who are centre stage (here, to the right of centre). Behind the dance master other dancers are waiting in the wings, one fastening her shoe. At the far right are two other men: one straddles a chair, and is wearing a top hat. The other leans back, his body almost straight on the chair, at an angle of about 45 degrees to the stage, seemingly asleep, his hands thrust deep into his trouser pockets. The two men at the right are most probably ‘subscribers’, who paid a lot of money in return for privileged access to the young girls. If so, it is a clear reference to the dark side of the ballet, discussed below. Edgar Degas (1834–1917), Ballet Rehearsal (1875-77), pastel on cardboard, dimensions not known, Pushkin Museum of Fine Arts, Moscow, Russia. Wikimedia Commons. 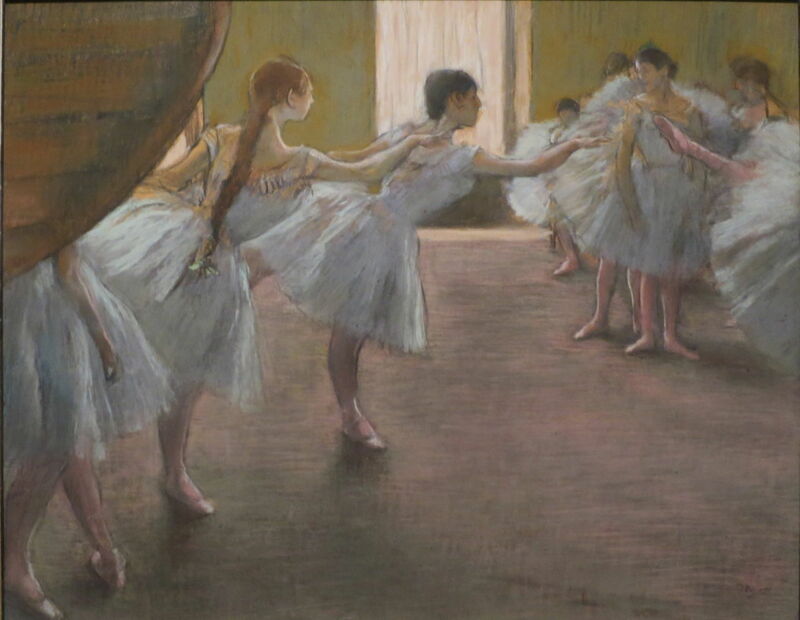 Degas’ pastel painting of Ballet Rehearsal (1875-77) has moved to the new building, and shows a new foyer area. It features two dancers in the same position in the left foreground, who echo one another. At the left edge, another dancer is hidden to the point where she is just an arm and a pair of legs. To the right is another group of dancers, superimposed to enhance their disembodiment into various legs, and at the right edge a single leg is kicked in over them. Edgar Degas (1834–1917), During the Dance Lesson: Madame Cardinal (c 1878), oil on canvas, 81 × 76 cm, Philadelphia Museum of Art, Philadelphia, PA. Wikimedia Commons. During the Dance Lesson: Madame Cardinal from about 1878 is, at first sight, one of the most puzzling of these paintings. Three dancers are practising in the upper left, in front of a large mirror. The reflection in that mirror not only shows the reverse of those dancers, but the view of Paris through a window behind the viewer. Another pair of dancers are at the right edge, almost cropped out of the image. Two people are in the midst of this: a frumpish woman lounges on a chair in the foreground, and is reading a newspaper, apparently disinterested in the dancers in front of her. Behind, and to the woman’s right, a bald-headed man stands watching the dancers in front of the mirror. Only the last two words of this painting’s title give the vital clue as to how to read it: Madame Cardinal is the leading character in a series of novels written by Ludovic Halévy, a childhood friend of Degas. Best known of them is the compilation titled Les Cardinals, which was published in 1883. These stories tell of Monsieur and Madame Cardinal, lower middle class Parisians who have two daughters, Virginie and Pauline, aged around fifteen and members of the corps de ballet at the Paris Opéra. Madame Cardinal has no interest in ballet, or in her daughters, only that they bring in large sums of money from their relationships with admirers, who are ‘subscribers’ of the ballet. She thus encourages them into prostitution, with her husband’s consent. Halévy’s stories were first published in serialised form from 1870 onwards, and were enormously popular. Degas created illustrations for Halévy’s books in the form of forty monotypes in about 1876-80, which were then turned into soft ground etchings prior to publication. Some of these monotypes were shown in the Third Impressionist Exhibition, where they were critically admired. These monotypes were made during a period in which Degas used the technique to explore some of the seedier aspects of life, including a series of scenes from brothels which were not exhibited during his lifetime. There can thus be no doubt that During the Dance Lesson: Madame Cardinal is a narrative work, and refers to the widely-known practice of prostitution which took place at the ballet of the Paris Opéra at the time. Although the age of consent in France then was only thirteen, by modern standards Halévy’s explicit reference to the age of the dancers being fifteen would make that child prostitution – the same problem which was plaguing London too. Degas may not have been as overt as his follower Jean-Louis Forain (1852–1931) in depicting this issue, but he was well aware of it, and referred to it more obliquely. The Dance Lesson (c 1879) is an early painting in a series of about forty wide-angled views which Degas painted on panoramic canvases during the late 1870s and 1880s. This was exhibited at the Fifth Impressionist Exhibition in 1880, but went largely unnoticed. Various suggestions have been made as to what he intended, and most have drawn attention to their panoramic, frieze-like images. At the left, a dancer sits, her head resting on the heel of her left hand, apparently upset or despondent. Under her is a double bass, which is resting on its back on the floor. Nearby is evidence of Degas having painted out, at an early stage, what would have been a violin case. To the right, a senior dancer sits, presumably instructing the younger dancer in front of her. At the upper right, and in the distance, a group of half a dozen dancers are preparing themselves or waiting for a class. One possible reading is that those at the far right are waiting to be taught by the teacher, who has just criticised or admonished the dancer who is now sat on the double bass, making it a narrative sequence of the suffering of the ballet pupil. Edgar Degas (1834–1917), Preparing to Dance (The Double Bass) (1887), oil on canvas, 37 × 87 cm, Museo Nacional de Bellas Artes, Buenos Aires, Argentina. Wikimedia Commons. Preparing to Dance (The Double Bass) is a preparatory compositional sketch which Degas is thought to have made in 1887, but was almost certainly part of his studies for the finished painting below. 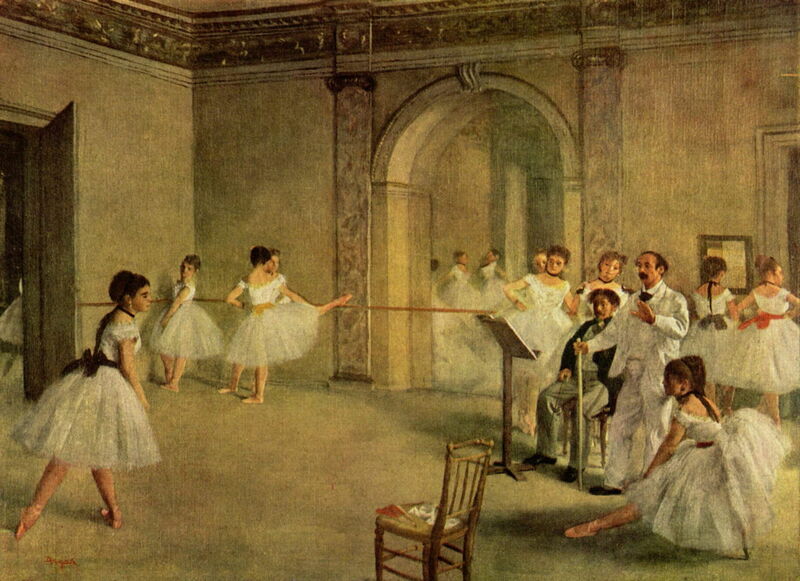 Degas uses a similar room and layout to that of The Dance Lesson above, with the double bass now shown almost fully, and spread across much of the left half of the picture. At the bottom left, the neck and head of another double bass is also visible. 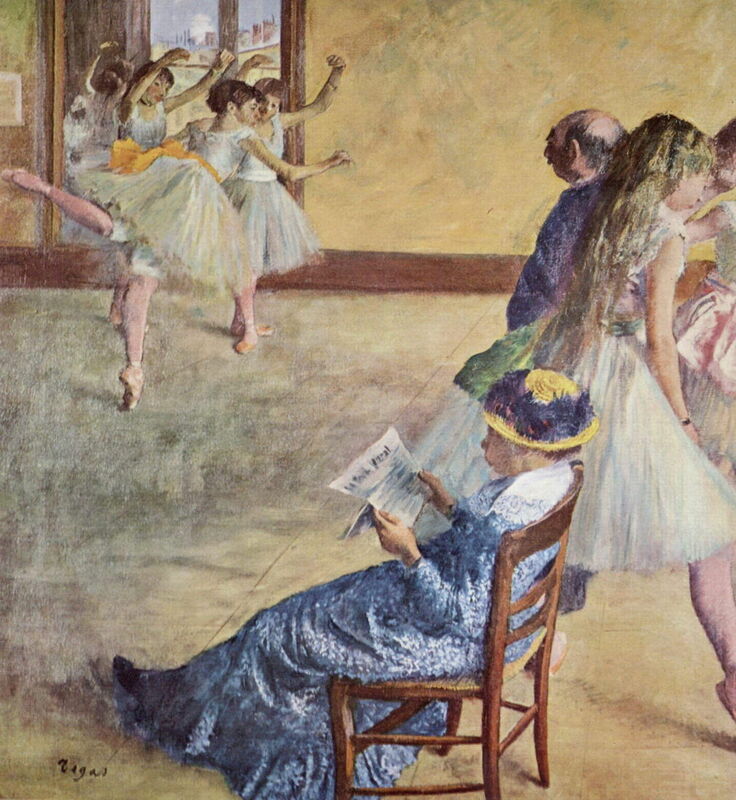 Just to the right of centre, a dancer adjusts her right shoe, a favourite view of Degas’. Other dancers adjust their dress and prepare to dance, progressing to the brightly-lit upper right. Edgar Degas (1834–1917), Dancers in the Rehearsal Room with a Double Bass (c 1882–85), oil on canvas, 39.1 x 89.5 cm, Metropolitan Museum of Art, New York, NY. Wikimedia Commons. The finished painting, Dancers in the Rehearsal Room with a Double Bass, has been dated to about 1882–85, but clearly would have been painted after the study shown above. Why a double bass? I think this refers to the music which accompanies performances, its form refers to the hourglass shape of the dancers exaggerated by their dress, its size emphasises the small size of the girls, and it may be a subtle symbolic reference to the ever-present ‘subscribers’, rather than showing them directly. Edgar Degas (1834–1917), Before the Ballet (1890-92), oil on canvas, 40 x 88.9 cm, National Gallery of Art, Washington, DC. Courtesy of The National Gallery of Art. In his later panoramic views of rehearsal, such as Before the Ballet (1890-92), the double bass has gone. 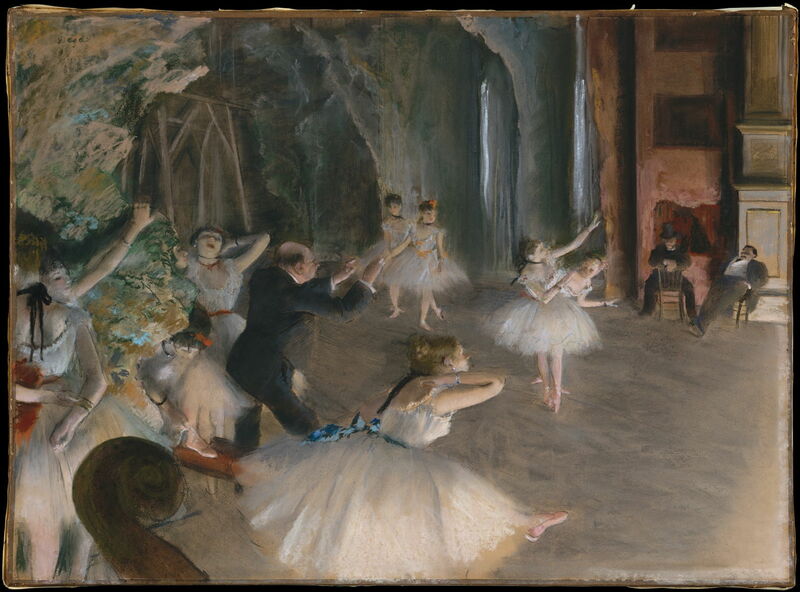 The two dancers in the right foreground are now adjusting their dress, one bending forward in Degas’ favourite pose, to adjust her left shoe. The other exaggerates the disembodiment of her legs, as she adjusts her tights. In the upper left, four dancers at the barre provide what could be superimposed images of a single dancer viewed from different angles. These are not simple paintings which should be taken at face value. Hopefully my comments have helped your personal readings of them, and have encouraged you to look again at these fascinating and little-appreciated paintings. George B Ives’ English translation of Les Cardinals is available free on archive.org. Sadly, although illustrated, the prints are not those made by Degas. Posted in General, Life, Painting and tagged ballet, dancer, Degas, Forain, Halévy, narrative, painting, pastel. Bookmark the permalink.